Whether it's the gown your mother wore or a new one, you have envisioned your wedding day and your beautiful gown since you were a little girl. Your gown will always remind you of the best day of your life. 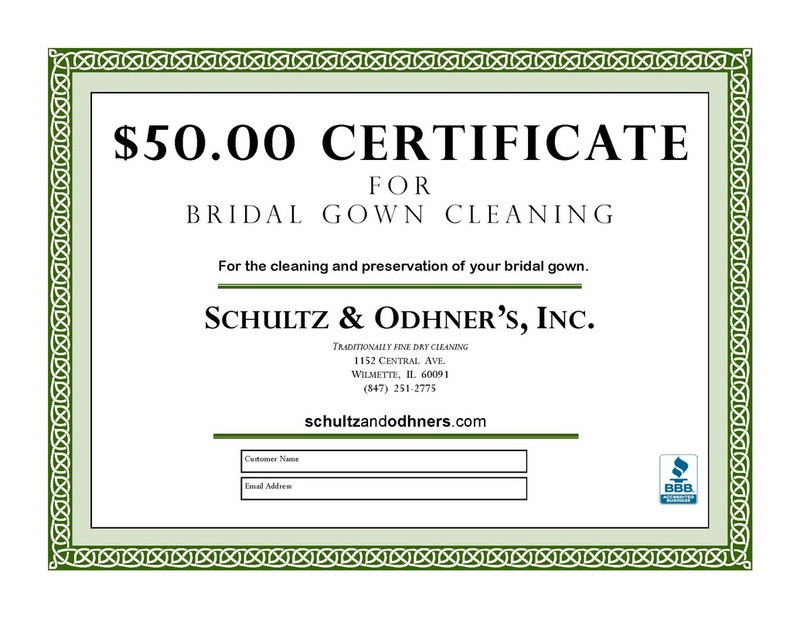 You want this gown to be dry cleaned by trusted professionals, Schultz & Odhner's, who have been caring for wedding gowns since 1901. We are a member of the Drycleaning & Laundry Institute, and continue to improve our knowledge of fabrics and solvents available to safely care for your garments. Is there trim or beadwork on the dress that can be cleaned with the same process as the dress? Will the lining shrink, or should it be handled differently? Whenever possible, get the instructions in writing. If you choose to wear an antique gown, bring it in for inspection and cleaning several months in advance. It may need alterations, and our seamstress can help with most modifications. Have your gown and your bridal party's formal wear professionally hand pressed prior to the big day. Our finishers are knowledgeable about fabrics and will custom finish each gown and bridesmaid dress for an elegant walk down the aisle. 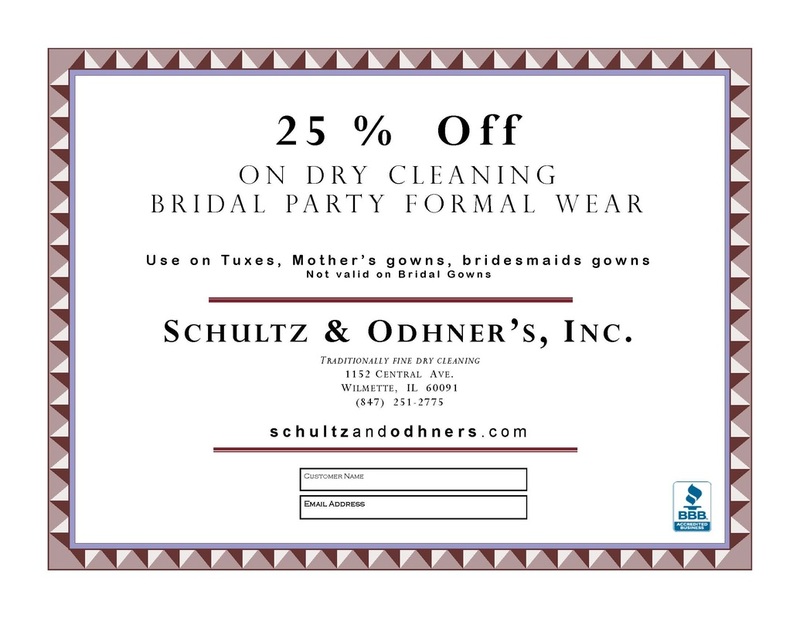 We at Schultz & Odhner's recommend that you have your dress professionally dry cleaned as soon as possible after the wedding. The dress may have stains on it that you might not notice, but could damage the gown permanently with time. It is a good idea to point out any spots to us that you know of and what may have caused them. We will be looking for the care label that is required for all garments. If you received special instructions from the store where you purchased it, you should supply us with this information. When the guidelines for care are followed, we can prevent harm to your dress. However, some care labels can be misleading with regard to trims and lining. We recommend having your gown heirloomed after being professionally cleaned by us. Heirlooming will help to preserve your memories in a special Keepsake Pak to prevent discoloration. Prior to packing the gown and veil, we fill the bodice with acid-free tissue to prevent wrinkles and absorb moisture in the material. Once packed, the box is sealed. Your veil can be boxed separately. Once heirloomed, store your dress in a cool, dry place and inspect it from time to time. Your gown deserves your attention both before and after the wedding. We are confident that you will be pleased with Schultz & Odhner's as your choice for taking care of this very special garment and keepsake. With a gown that's been well cleaned and preserved, the memories of your wedding day will be everlasting.